Optional: dipping sauce marinara, ranch, etc. Set out rolls to thaw. Once thawed, use your hand to roll a dough ball into a small tube. Flatten with rolling pin and roll out into a 7" rectangle. Place one stick cheese in the middle. Fold the dough around it. Set aside, and finish the rest. 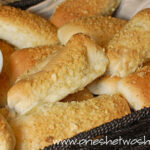 Brush each breadstick with butter and roll on a plate of crushed Sour Cream and Onion chips. Place seam-side-up on a greased sheet pan. Bake at 350 for about 15 minutes, or until the tops turn golden brown.